Welcome to the HyperAdX Integration and API documentation! HyperAdX uses Placement ID to allow access to the API. You can register a new App and create Placement at our developer portal. On placements list click on Tag & SDK and select appropriate integration. The HyperAdX’s Native Ads allows you to build a customized experience for the ads you show in your app. When using the Native Ad API, instead of receiving an ad ready to be displayed, you will receive a group of ad properties such as a title, an image, a call to action, and you will have to use them to construct a custom UIView where the ad is shown. Download latest release and extract the HADFramework for iOS. Open your project target General tab. Drag the HADFramework.framework file to Embedded Binaries. Add the AdSupport framework to your project. If you want to support iOS7 - download our legacy SDK. It supports only NativeAds. @IBOutlet weak var bannerView: UIView! @IBOutlet weak var imageView: HADMediaView! @IBOutlet weak var iconView: HADMediaView! @IBOutlet weak var cta: UIButton? You may set content param on HADNativeAd initialization to get only needed properties. If you didn’t set content param then you get all properties. The Native Ad templates allows you to use prepared Ad banner views but with possibility of full customization. Just add HADBannerTemplateView to your view controller and set desired banner template and custom params. @IBOutlet weak var bannerTemplateView: HADBannerTemplateView! Download latest release and extract the Example app for Android. Put the HyperAdxSDK_xxx.jar in “libs” folder in your Android Studio or Eclipse. Add it to dependencies in build.grandle file. Also you need to add google play services. Modify the onAdLoaded function above to retrieve the ad properties. The SDK will log the impression and handle the click automatically. // Download and setting the cover image. //  Downloading and setting the ad icon. You must replace PLACEMENT_ID with your placement’s ID. The HyperAdX Banner ads allows you to monetize your iOS apps with banner ads. This guide explains how to add banner ads to your app. If you’re interested in other kinds of ad units, see the list of available types. Download and extract the HADFramework for iOS. The HyperAdX Interstitial ads allows you to monetize your iOS apps with banner ads. This guide explains how to add banner ads to your app. If you’re interested in other kinds of ad units, see the list of available types. The HyperAdX Interstitial ads allows you to monetize your Android apps with banner ads. This guide explains how to add banner ads to your app. If you’re interested in other kinds of ad units, see the list of available types. Then, create a function that requests a interstitial ad. The SDK will log the impression and handle the click automatically. With sending in-app events triggered by your users you can improve your monetization and get higher earnings. Our platform automatically build audiences using your in-app data (provided by your events) and assigns high performing campaigns individually to each segment. Also our advertisers and mediabuying department make higher bids for more engaged users. You can send the events very easy. Just call the method sendEvent(Context, event_code) from HADEvent class. You can send the events very easy. Just call the method sendEvent(type: HADEventType) from HADEvent class. 429 Too Many Requests – You’re requesting too many ads! Slow down! 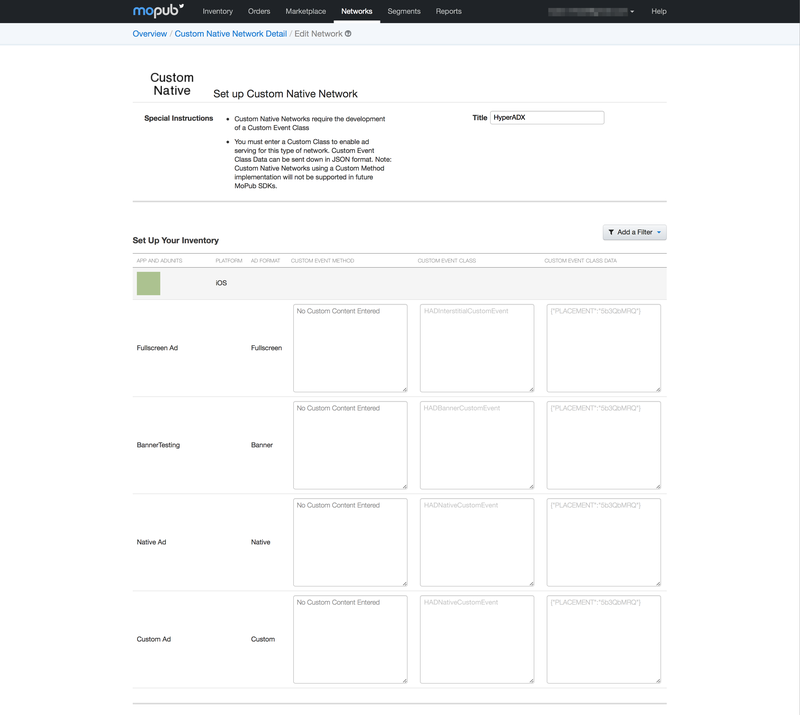 You can find Mopub adapter example in HyperadxiOSADs_Sample_VERSION/Mediation Adapters/MoPub/. @IBOutlet weak var nativeView: NativeView! @IBOutlet weak var mainTextLabel: UILabel! @IBOutlet weak var callToActionLabel: UILabel! @IBOutlet weak var iconImageView: UIImageView! Download and extract the Mopub adapter if needed. 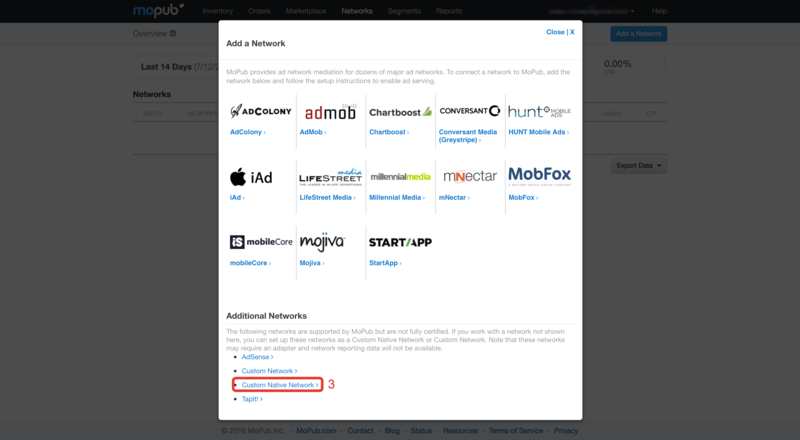 Create an “Hyperadx” Network in Mopub’s dashboard and connect it to your Ad Units. This is your adapter. Now you can use Mopub as usual. 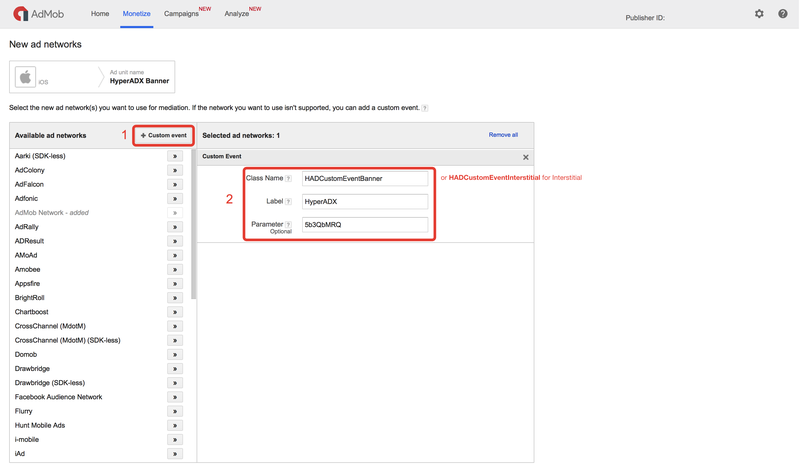 You can find Admob adapter example in HyperadxiOSADs_Sample_VERSION/Mediation Adapters/AdMob/. First of all you need to add new app in AdMob console. You will get UnitId string like ‘ca-app-pub-+++++++++++++/+++++++++++++’. For the next few hours you may get the AdMob errors with codes 0 or 2. Just be patient. Then you need to add new mediation source. Fill Class Name field with a HADCustomEventBanner. And a Parameter with your HyperAdx statement string. Now you can setting up your Xcode project. Fill Class Name field with a HADCustomEventInterstitial. And a Parameter with your HyperAdx statement string. Download and extract the AdMob adapter if needed. You will get UnitId string like 'ca-app-pub-**********/**********’. For the next few hours you may get the AdMob errors with codes 0 or 2. Just be patient. Fill Class Name field with a com.hyperadx.admob.HADInterstitialEvent string. And a Parameter with your HyperAdx statement string. Now you can setting up your android project. Put HyperAdx-SDK and AdMob-adapter in 'libs’ folder. NOTE - Admob interstitial may not work in emulator. Use real devices even for tests!